Credit rating agencies are among the most puzzling institutions of our times. Formerly largely unknown, the raters have become a focus of political and media attention since the Asian financial crisis of 1997-98.
Credit rating agencies are among the most puzzling institutions of our times. Formerly largely unknown, the raters have become a focus of political and media attention since the Asian financial crisis of 1997-98, as people have repeatedly questioned the accuracy and timeliness of their ratings with successive episodes of rating ‘failure.’ The global financial crisis that started in 2007 has greatly heightened these concerns while the European sovereign debt crisis that began in 2010 has demonstrated the continuing importance of the agencies despite persistent concerns about their competence. I argue the agencies have become increasingly important non-state actors. Rating agencies, because they are private, turn formerly political problems, such as say, the funding of a bridge’s construction, into ostensibly technical issues. This transformation reduces the scope for political debate. But recurrent episodes of rating failure and the associated criticism of the agencies highlight the fragility of this system. The subprime crisis that began in 2007 caused dismay and panic throughout governing circles in developed countries as efforts to reignite confidence in the financial markets failed. The crisis revolved around mortgage lending for housing purchases by buyers with weaker than ‘prime’ personal credit ratings. The financial markets developed a series of exotic financial instruments associated with these housing loans to allow lenders to reduce their balance sheet risk. Other institutions traded in these derivatives. Given that the subprime securities market was worth only $0.7 trillion in mid-2007, out of total global capital markets of $175 trillion, the impact of subprime assets was out of all proportion to its actual weight in the financial system. When people think of financial innovation they inevitably think of computers and highly-educated ‘rocket scientists’ developing quantitative techniques for managing risk. But that is not at the heart of this matter. Lawyers are the key to the problem. The real essence of structured finance is to be found in the legal rights to revenues organised in the contracts and trusts which underpin the securities. This documentation can run into thousands of pages. These legal underpinnings give different rights to different tranches of a security. Some, such as the AAA tranche, have the right to be paid first, while others have to wait in line. This is how a mass of not very creditworthy subprime mortgages could produce some AAA bonds. These investors had first right to revenue and the expectation was that even if some subprime mortgage holders defaulted as expected, enough would pay so that those with the highly rated securities would be paid in full. Unfortunately, when expectations are upset and people are full of uncertainty as in 2007-09, this model does not work. But as disastrous as this is, the rating agencies’ real failure was something else: their move into the markets themselves. For decades Moody’s and Standard & Poor’s had played the role of a judge or referee, standing back from the action and making calls as necessary. This role is what they were valued for and it is this which allowed them to build up reputational assets. The problem is that structured finance is only possible with the active involvement of the rating agencies in designing financial instruments. The agencies and their ratings actually created the distinct tranches or levels of specific structured finance issues. Because of the complexity of the legal documentation and protection necessary for these tranches, the raters did not stand back as neutral judges as they normally would. In structured finance, the raters acted more like consultants, helping to construct the securities themselves, indicating how they would rate them if they were organised in ways that offered specific legal protection to investors. Concerns about how the agencies are funded became widespread with the onset of the subprime crisis. The primary criticism was that the ‘issuer-pays model’, although established for forty years, was a scandalous conflict of interest because it means that the agencies have incentives to make their ratings less critical than they would if they were paid by investors, the ultimate users of ratings. Critics called for an end to the issuer-pays model of rating agency funding. A vigorous—if often poorly informed—debate about the merits of regulating rating agencies has taken place since the onset of the crisis in spring 2007. Behind the rhetoric, it is very clear that both American Securities and Exchange Commission (SEC) and European Commission officials are reluctant to regulate either the analytics of the rating process itself, or the business models of the major rating agencies (the issuer-pays model). In amendments to rules announced in February 2009, the SEC enhanced required data disclosures on performance statistics, methodology, and prohibited credit analysts from fee setting and negotiation or from receiving gifts from those they rate. How ratings are made and who pays for them are materially unaffected by these changes. This is also the case with the Dodd-Frank Act, 2010, which mandated further SEC reporting. Much the same can be said for European efforts. Hampered by the reality that Moody’s and S&P are both headquartered in the United States, for many years rating agencies were little more than ‘recognised’ in European states by local regulators who were free-riders on American regulatory efforts. With the Enron crisis, which led to the bankruptcy of the Texas-based energy trading firm, concerns about rating agencies grew and the International Organization of Securities Commissions (IOSCO) code of conduct was increasingly referred to in Europe as a useful form of self-regulation. With the onset of the global financial crisis European Commission officials have sought to regulate the agencies in Europe with proposed new laws passed by the European Parliament for referral to the Council of Ministers. This legislation, which is premised on local enforcement, creates a registration process, addresses the limited issues of transparency, disclosure and process. But it does not change rating analytics or challenge the issuer-pays model of the rating business. The global financial crisis is a crisis at the constitutive level. It reflects a deep loss of confidence in the basic infrastructure of the capital markets. This loss of confidence is a social rather than a technical process and tinkering with regulative rules, while tempting and politically distracting, will not address the heart of the matter. Like the Great Depression, it seems likely that the damage done to the social relationships which underpin global finance, such as the reputational assets of the rating agencies and the trust financiers have in each other, may take many years to rebuild and could be wiped out again by renewed crisis perhaps stemming from sovereign debt default. It is tempting in these circumstances to prescribe a simple fix, but institutions develop over time and like communities, do not heal instantly. Encouraging institutional diversity and restraining hubris about alleged cures is advisable. For the rating agencies, attending to the relationships and the expectations that built their reputations in the first place is their best course of action. The extent of substantial change is likely to be limited. Given all this, seeing the rating agencies as the brave new way forward for a market-centric civilisation seems risky to say the least. The global financial crisis has not been kind to anyone, but it has highlighted the necessary and vital role of government in times of upheaval. Credit rating agencies serve a useful purpose on most accounts in an increasingly capital market-based financial system. This form of market institutionalisation is growing around the world, displacing traditional bank lending. The agencies have a good track record rating corporates and governments over extended periods of time. But our reliance on credit rating agencies is problematic. The agencies serve narrow interests and in times of crisis these interests can make crises worse as they seek to exit a country or a company because of a rating downgrade. Yes, in the good times the agencies may appear to offer a neat market-based way of managing future risks. But when things get bad, as they always do eventually, are rating agencies equipped with the sort of wider responsibility and systemic regard we need? This article is part of NLP’s series, Left Politics in an International Economy. Kruck, Andreas. Private Ratings, Public Regulations: Credit Rating Agencies and Global Financial Governance. (Basingstoke: Palgrave Macmillan, 2011). Partnoy, Frank. “The Siskel and Ebert of Financial Markets? : Two Thumbs Down for the Credit Rating Agencies,” Washington University Law Quarterly, Volume 77, Number 3, 1999, pp. 619-719. Rethel, Lena and Timothy J. Sinclair. The Problem with Banks. (London: Zed Books, 2012). Sinclair, Timothy J. 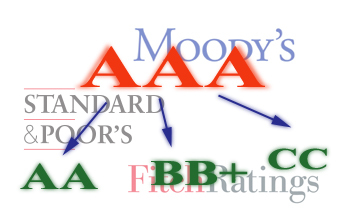 The New Masters of Capital: American Bond Rating Agencies and the Politics of Creditworthiness. (Ithaca, NY: Cornell University Press, 2005). _____. “Round up the Usual Suspects: Blame and the Subprime Crisis.” New Political Economy. Volume 15, Number 1, March 2010, pp. 91-107. The Dodd-Frank Act was the major US legislative response to the global financial crisis that started in 2007, led by Representative Barney Frank in the House of Representatives and Senator Chris Dodd in the US Senate. Timothy J. Sinclair is Associate Professor of International Political Economy at the University of Warwick. He is the author of ‘The New Masters of Capital: American Bond Rating Agencies and the Politics of Creditworthiness’ (2005), ‘The Problem with Banks’ (co-authored with Lena Rethel, 2012) and, most recently, ‘Global Governance’ (2012).